The Corral at Breckenridge condos for sale lie in a two building group of spacious, in town condos built in the late ’90s. At the intersection of Highway 9 and Broken Lance, they’re on the south side of Breckenridge, just across from the Ice Rink, on the free bus line. The Quicksilver lift is a short walk through Main Street Station, or a quick bus ride away. The buildings are stucco and log and designed with a slight nod to historic downtown Breckenridge, and look like several smaller structures, instead of massive ones. Because of the variety outside, the Corral at Breckenridge condos for sale come in a variety of interiors to suit individual tastes. From the Corral at Breckenridge trails lead through the condos on the Columbine Loop to the base of Peak 9, Main Street Station, the Village, and the heart of downtown. Start your search for that perfect home with the Corral at Breckenridge condominiums listings below, or read more about this Breckenridge community. The architects drew in individually, but the Corral was also designed to take advantage of the community these 65 units create. They have a common lobby, heated drive and well-equipped fitness room with a steam sauna. Each building has separate, outdoor Jacuzzi patios. 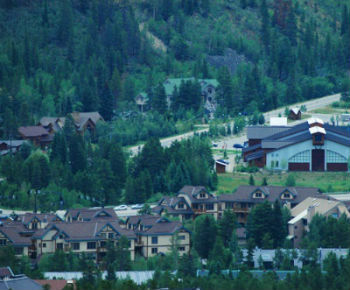 Many of the condos for sale in the Corral will come with a garage or a ski-storage locker. Some will have views of the ski area and others of Baldy Mountain, but all will have a deck from which to view it. The Illinois Creek Trail begins near the Corral and extends south through the forest on easement granted by several Warrior’s Mark subdivisions, and lead to national forest. This trail also crosses Highway 9 and continues east over Breckenridge open space to Little Mountains and the Blue River Trail. Illinois Creek is a great trail for dog walking or getting to the Breck Ice Rink, or the start of a longer adventure: running, hiking, snow shoeing or mountain biking. Size (SFLA): 800 sq. ft to 1540 sq. ft. Amenities: Elevator, Fitness Room, Front Desk, Hot Tub, sauna balcony. Located just off Highway 9, at the entrance to Warrior’s Mark. Drive south on Main Street to last stoplight at Boreas Pass Road, turn right on Broken Lance Drive. The Corral at Breckenridge will be on the left. 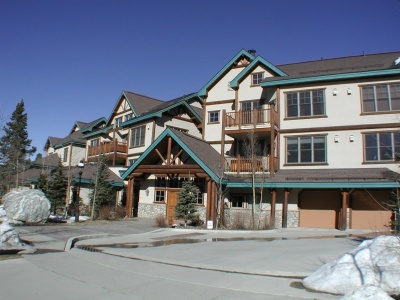 Are you ready to find that perfect condo in Breckenridge, CO? Send us a message to chat with an expert today!